Can’t get a good night’s sleep? Many older adults experience trouble falling or staying asleep. It is normal for hormonal and other natural changes to cause the internal body clock to shift throughout one’s life. Senior citizens still require the same amount of sleep as younger adults do, and should take good care in getting an adequate amount of sleep for improving overall function. In the case of older adults, the circadian rhythms are especially geared toward going to sleep early and arising early. Read on for some tips to getting a good night’s sleep. Setting a routine can be very helpful in maintaining natural circadian rhythms. Try setting a regular sleep schedule and stick to it and go to bed the same time each night and awake the same time each day. Not only are sleep schedules important, but eating meals the same time each day and exercising the same time each day can assist the body in getting into a routine, leading to a better night’s sleep. A good rule of thumb is to avoid caffeine after 3 PM for a good night’s sleep. It is imperative for a good night’s sleep to make the sleeping quarters relaxing, comfortable and distraction free. Try keeping the bedroom dark, simple and clutter free. If there’s too much light coming in through the windows, invest in black-out curtains. Resist the temptation to hang out in bed and use it only for sleeping. Most importantly, get rid of electronics and clocks in the bedroom. Studies have shown reducing electronics and clocks lead to a better night of slumber. Thirty minutes to an hour before bed, try to set up a relaxation routine. Make sure all electronic devices are turned off, especially the television. Pray, meditate or just sit in a quiet, comfortable space and consider doing a calming form of exercise for the nervous system. Choose an activity that takes minimal brain effort, such as light reading, writing in a journal, or listening to music. At night, the body’s melatonin should naturally increase, while serotonin naturally decreases. If difficulty occurs to fall asleep, try these natural foods containing melatonin; cherries, apricots, fruits, and peaches. Additionally, tuna, salmon, halibut, garlic and pistachios contain high amounts of Vitamin B6, which are then converted to make both melatonin and serotonin, which can help regulate the sleep cycle. Magnesium and potassium are also essential minerals for the body. Adequate amounts of magnesium and potassium can help calm the nervous system as well as relax muscles. 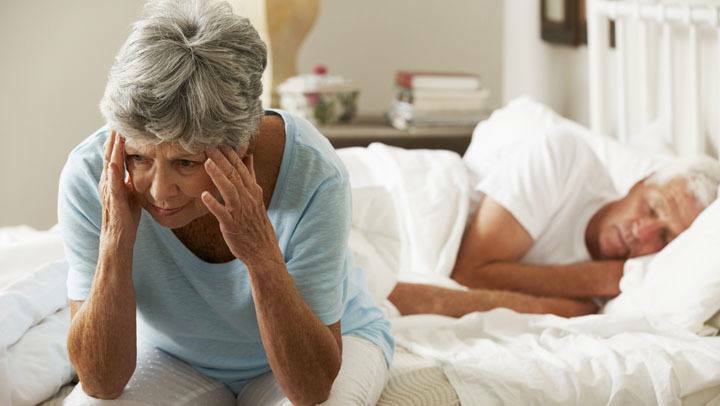 Underlying health conditions and medication issues can sometimes prevent senior citizens from getting adequate sleep. It is very important to talk to a doctor about any sleep concerns, so that he or she can check for further issues.